In 2003 to commemorate the 21st Birthday of HRH Prince William of Wales, the Perth Mint was commissioned to strike a special commemorative Silver Proof coin in honour of the young Prince's 21st birthday - crafted in superb colour. As the eldest son of Prince Charles and the late Princess Diana, William has become one of the most popular Royals in the world. This special 1oz, crown sized coin is struck to Proof quality from .999 pure silver. Australian Legal Tender Coin. 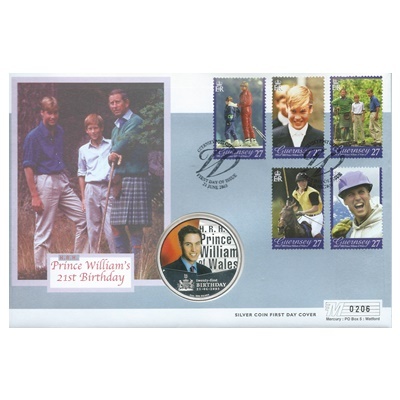 The cover features a 2003 Perth Mint Silver Proof $1 coin and is complemented with five Royal Mail stamps, each depicting an image of Prince William. 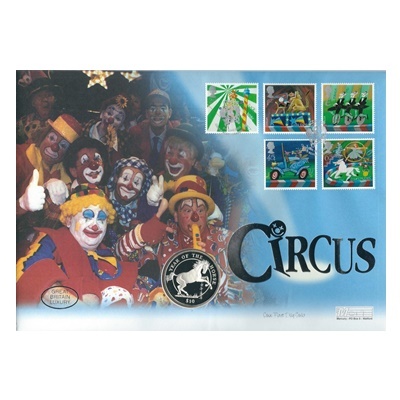 Postmarked 21st June 2003 - Guernsey Post Office . Mintage is only 12,500 Worldwide.